major effect on our environment. Most electricity is produced by burning coal - a LOT of coal. Burning of coal is highly polluting and release CO2 into the atmosphere. The world's demand for electricity will grow by 85 percent between 2010 and 2040 - this increase is more than today's total use of electricity in the USA, the European Union, China, Russia, Japan, Australia and India. The burning of coal is the worlds largest source of electricity. If nothing changes most of the increased production of electricity will come from burning more coal. A LOT more! Do you put your stereo on standby? Only 35 percent of coal's energy (and some say at the most) is made into electricity in coal-fired power plants. The rest is lost as waste heat. 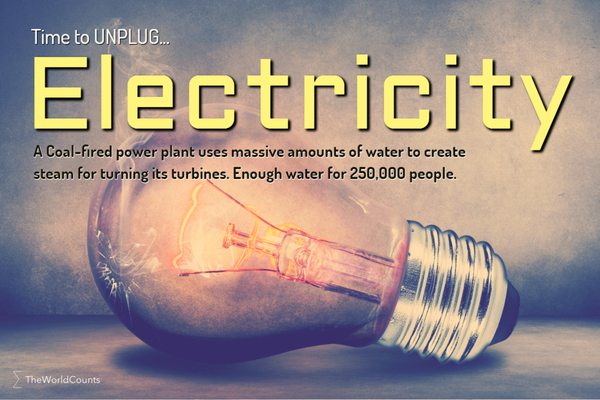 A typical coal-fired power plant uses massive amounts of water to create steam for turning its turbines. Enough water to support a city of approximately 250,000 people. Burning coal is a leading cause of smog, acid rain, global warming, and air toxics. The world consumes 21,325,115 GWh of electricity a year equivalent to 76,770,414 terajoules. Electricity is a carrier of energy. It is the flow of electrical power or charge, made by converting “primary” sources of energy such as coal, oil, gas, wind, and solar energy. A terajoule is a measure of energy. One terajoule equals 1 billion joules - a unit of energy named after English physicist James Prescott Joule in the 19th century. In everyday terms, a joule is the amount of energy needed to lift an apple about one meter against the Earth's gravity. Interested in more facts like the consumption of electricity? Then plug in and subscribe to our newsletter.